This blog isn’t just about running. Lately it’s not about much at all: sorry for the silence! I’m handling a stress reaction/fracture in my foot. This means: wearing a big plastic boot, most of the time, which also means: not running. Since May 21! Not walking much, either. But I’ve gotten the go-ahead to do some hiking in stiff, tall boots, which I’ll do in Montana, shortly. Surprisingly, the injury doesn’t mean I have all sorts of free time available to write stories: I’m filling up the running spaces with swimming, biking, and also a bit more gardening than last year. Up, and new this year: cabbage! Let’s see if it survives 2 weeks without us, during our upcoming vacation. Another thing the injury has allowed/forced me to do: my typical volunteering stint at the Afton Trail Run, but this time parked at a strategic spot with my cameras. This event was a couple days ago, out at Afton State Park. I love running at this park, though there are other months in which I prefer to race or even run there. In July it’s hot! And humid! I’ve run in this race once, but I prefer to volunteer at it. My current foot injury happened since I signed up to volunteer, and I’d planned to roam the course a little more. However, the boot dictated a less mobile role: I needed to choose a spot or two, and attempt to be on my feet as little as possible. 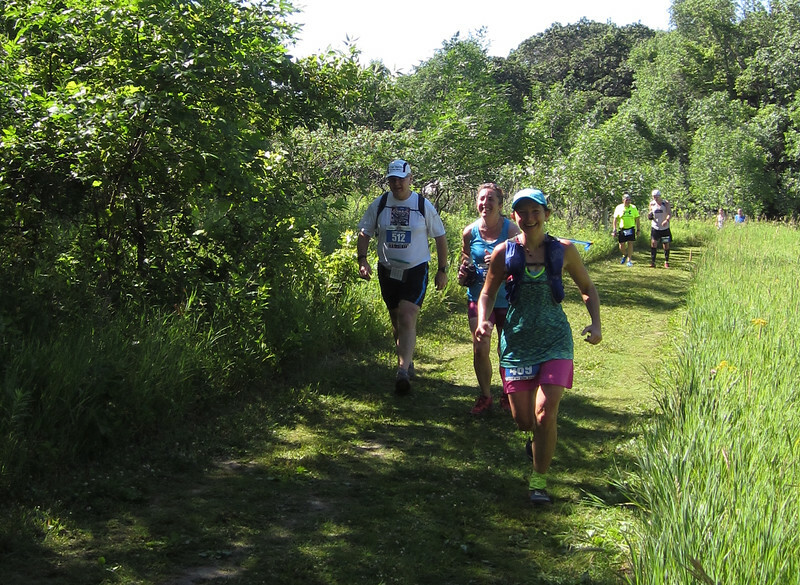 I opted for a semi-shaded area, just before the aid station at the 20.3k/12.6 mile marker. All of the runners (those doing 25k and those doing 50k, coming through on their second lap) had just completed the rather nasty, long hill climb of the Meat Grinder. The 50k started at 6:30 and we were to expect arrivals by 7:30. I completely filled up my only two 512MB memory cards for my digital SLR (a Canon EOS DIGITAL REBEL XT) around 9am – before even half the runners had passed through my spot. I wondered if I should have found more cards -or cards with more capacity- beforehand but as it turns out, CompactFlash appears to be nearly obsolete and I wouldn’t have found any locally anyway, this week (Is this going to be the reason I finally cave and buy a mirrorless camera? I’ll have to save up!). Another reason the cards filled up so soon: I keep the image quality settings kind of high – just shy of RAW – because I really like having all that data for later. But… it probably wasn’t necessary for volunteer photography at a race. Also, my high setting is truly overkill: I very rarely blow pictures up to a big enough size that would need all that pixel information. This I learned from this handy article from SmugMug. The last time I bought a camera, the upper end of photo quality was close to the lower end of resolution needed for good 8×10 print quality. Apparently, things have improved! Ah well, lesson learned. Maybe some runners will appreciate the access. Also: I’m glad I didn’t have to post-process more than 479 photos!! That appears to be a division trophy. Luckily, I had my backup pocket digital camera (a Canon PowerShot ELPH 100 HS) with which to continue shooting but I felt a little like a dork being a semi-official course photographer (albeit an unpaid one) shooting with a little orange Elph. I did find that shooting with the Elph, which has a back-of-camera LCD monitor but no viewfinder, allowed me to interact a little more with the runners before getting a good shot, and it was great for shooting a few candids at the finish area. However, the darn thing advances to the next screen so slowly that I missed several action shots. And as I didn’t trust the photo quality with the digital zoom at all, I only used the optical zoom – and so later had to do quite a bit more cropping afterward, to get better shot composition. I put maybe 10 hours of post-processing into the photos I took, using mostly Adobe Lightroom 4. As mentioned above, I did a fair amount of cropping. Additionally, those grassy greens and the dappled light were a bear to adjust in order to get discernible facial features! I did a mix of color and exposure correction, as well as some dodging and burning. There were several images I edited out for bad focus, though I left a few blurry shots as the direction of blur in them seemed to improve the shot. It ended up being a shorter day than I’d planned, mostly due to the memory card issue. However, shooting a few candids at the finish line gave me great opportunity to talk with a few runners about their races, including a few friends from my running club. I’m often a little too shy to do this -or just super tired and wanting to get somewhere to put my feet up- after I race. It was a rewarding discovery! Wait. Are they smiling because of my boot? Despite the wonderful energy and conversations there past the finish line, I was tired and feeling guilty/foolish for standing and walking so much with my boot. A moment arose in which I could help a tired runner friend out by driving her down to her car, parked at a distant overflow lot. I followed her out, and headed home to begin my post-processing and uploading. Years ago (in the 1980s! ), I did a lot of sports photography, mainly for my school paper. It was really fun to get back into it – to move around to find a good vantage point (darn, I’m tall included one of the revelations), and to poke around to find what seems to work well in terms of shot angles and gestalt.